StumbleUpon, one of the early web pioneers, is shutting down. Its creator, Garrett Camp, hopes you’ll move to his new discovery platform called Mix. Regardless, this is a sad day for those of us who remember the excitement of using StumbleUpon back in the day StumbleUpon For Firefox - It's Still Awesome StumbleUpon For Firefox - It's Still Awesome Where do you get your fix of fun, interesting sites to look at? These days, it's probably Reddit, Twitter or Facebook. But do you remember the time when the best site to find new interesting... Read More . For the uninitiated, which we suspect is anyone under the age of 30, StumbleUpon is/was a social discovery platform. Long before social networks took over our lives, StumbleUpon surfaced great content on the vast resource that is the internet. Using StumbleUpon was as easy as clicking a button. You would then be whisked off to a random website as recommended by StumbleUpon users. This provided a welcome alternative to searching Google everytime you wanted to find something interesting. Sadly, all good things must come to an end, and this is even true of StumbleUpon. In a Medium post, StumbleUpon co-founder Garrett Camp explains why this is the right time to shutter StumbleUpon, and what is popping up in its place. Essentially, Camp and his colleagues feel that StumbleUpon is a vestige of the past. StumbleUpon was built for an earlier time when simplicity was king. But people now expect more, and “contextual curation” is more likely to pique people’s interests. To this end, Camp is hoping loyal StumbleUpon users (of which there have been 40 million over the years) will switch to Mix.com. This is a new discovery platform that looks like Pinterest for content, with collections of articles based around themes. 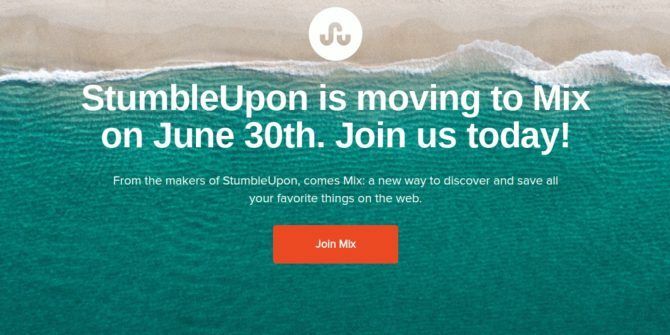 StumbleUpon will be shutting down on June 30, with existing accounts transitioned to Mix.com in the coming months. With a few clicks, StumbleUpon users will be able to import their favorites, interests, and tags across to the new site. StumbleUpon is the second website-from-yesteryear to bite the dust this month, with Klout shutting up shop Klout Shuts Down and Your Klout Score Is No More Klout Shuts Down and Your Klout Score Is No More Klout is shutting down, and your Klout Score is disappearing with it. And you're either just learning Klout still exists, or are scratching your head in confusion right now. Read More too. However, as sad as these departures may be, they’re just a sign that the world, and the world wide web with it, have moved on. And then some.